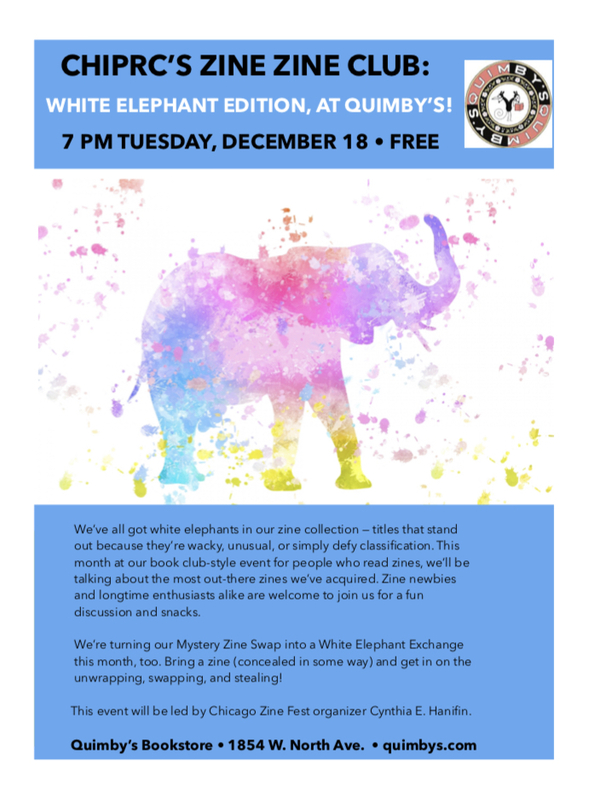 CHIPRC’s Zine Zine Club: White Elephant Edition, at Quimby’s! We’ve all got white elephants in our zine collection — titles that stand out because they’re wacky, unusual, or simply defy classification. This month at our book club-style event for people who read zines, we’ll be talking about the most out-there zines we’ve acquired. Zine newbies and longtime enthusiasts alike are welcome to join us for a fun discussion and snacks. We’re turning our Mystery Zine Swap into a White Elephant Exchange this month, too. Bring a zine (concealed in some way) and get in on the unwrapping, swapping, and stealing! This event will be led by Chicago Zine Fest organizer Cynthia E. Hanifin. Here’s the Facebook Event Invite for this month’s ZZC. Tags: CHIPRC, Cynthia E. Hanifin, Zine Club, Zine Zine Club, zines, ZZC.